The Robert Etheridge Jr Medal is awarded biennially by the AAP Executive Committee on the basis of lifetime contributions to Australasian palaeontology. The Mary Wade Prize will be awarded biennially by the AAP Executive Committee for the best paper(s) published in the previous two years in a peer-reviewed AAPpublication (currently, Alcheringa and Australasian Palaeontological Memoirs) by an early career researcher as sole or first author. The A. B. Edwards Medal is awarded on an annual basis for the best paper on aspects of economic geology published in the Australian Journal of Earth Sciences. 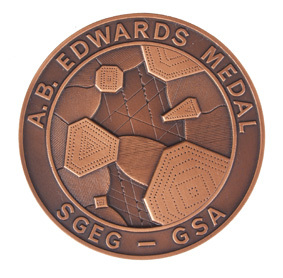 This medal may be awarded at each regular field conference of the SGTSG for an outstanding research paper arising from postgraduate research on some aspect of structural geology or tectonics. 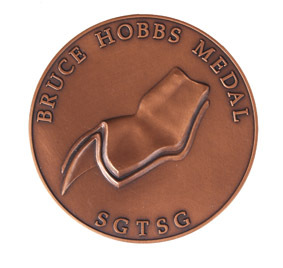 This medal may be awarded at each regular field conference of the SGTSG for excellent contributions to structural geology.